Home Unlabelled Ghanaian Police Arrests 30 Yahoo Boys...And 29 Of Them Are Nigerians! Ghanaian Police Arrests 30 Yahoo Boys...And 29 Of Them Are Nigerians! 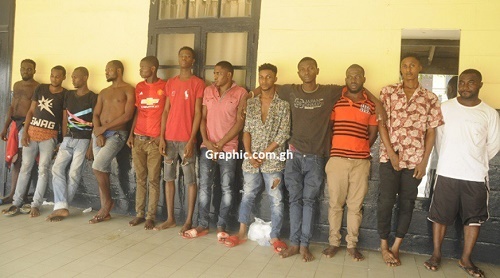 30 suspected fraudsters (yahoo boys), have been apprehended by the Achimota Mile 7 Police in Accra, Ghana and 29 of them are reportedly Nigerians. The arrest was made in an early morning swoop on a house at Alhaji Tabora Str in Accra. According to Graphic.com, about 34 laptops and 48 mobile phones were retrieved from the fraudsters. The suspects were also linked to a dead body that was found wrapped at the Apenkwa neighbourhood two weeks ago. The suspects rounded up were, Ike Ogu, 24; Ike Iduozi, 23; Blessing Adebayo, 25.